Completed in 1989, the Kowloon Park situated in downtown Tsim Sha Tsui is virtually an oasis in the city, not to mention that it is also popular among both local and oversea birdwatchers. The lush vegetation in the park, including the nature conservation yards, open lawns and waterfowl pond, attract many species of wild birds. 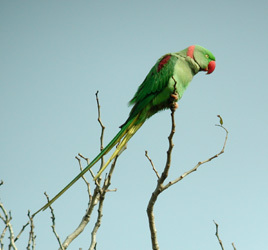 Over 100 species have been recorded in the Park till now. It is also a hot spot for watching passage migrants in spring and autumn. The Crested Bulbul Club of the Hong Kong Bird Watching Society arranges free birdwatching tour within the park for the public every Friday from 7:30am. The place of assembly is outside the McDonald's restaurant at the main entrance of the swimming pool.